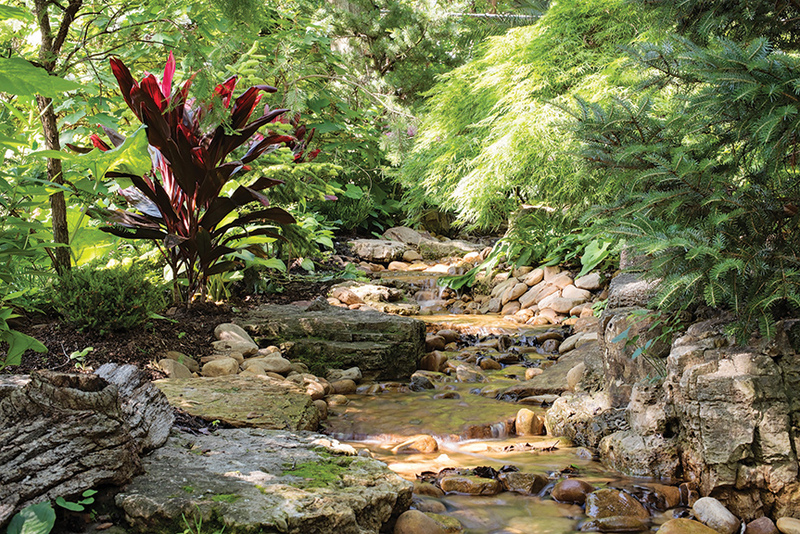 After sharing his talents all around the St. Louis area, Rand Rosenthal loves to return home to his own tranquil garden. You’ve seen his talents at The Muny and at Straub’s grocery stores, and he’s all over the Warson Woods Antique Mall. But Rand Rosenthal’s talents have nothing to do with song and dance or promoting a tasty morsel or two. 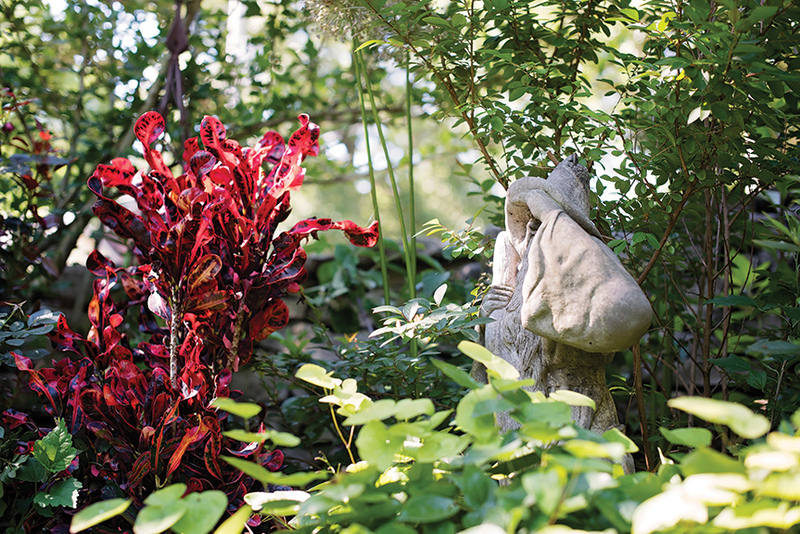 Tucked in a quiet corner of Webster Groves, Rand had his eye on the home and garden long before it came on the market. The dry-stacked stone wall that surrounds the 1/3-acre lot and the charming, cottage-style home appealed to his love of rustic antiques. Rand also took in the good bones provided by the natural slope of the property, interior stone work and pathways and the remnants of interesting plant material left by a former horticulturist homeowner, even though most of it was covered by weedy honeysuckle, mulberry and junk trees. 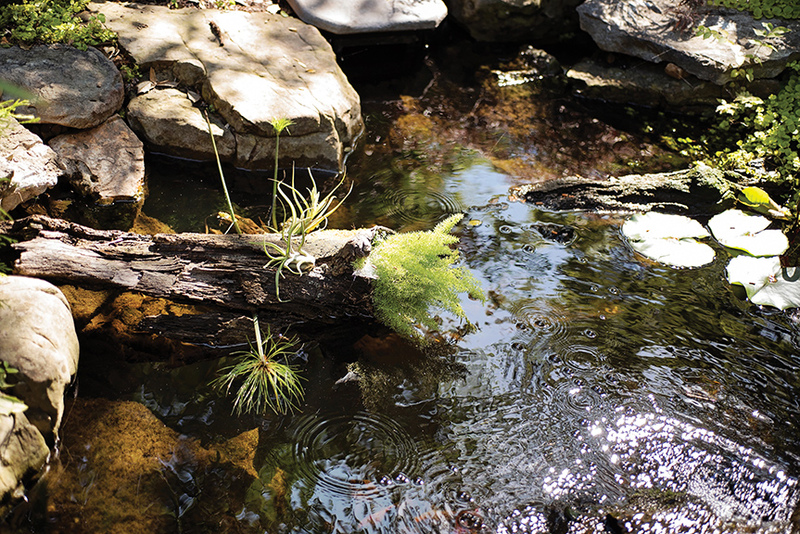 In the 16 years Rand has owned the property, he has not only cleared the land, but he has created two streams and three ponds, all separate from each other, and surrounded them with what he calls “a melting pot of a garden” that is as fluid as the streams that connect the outdoor spaces. His most recent addition is the third large pond just off the front porch that allows him and Karen to actually view the water from the house as well as hearing the sound of the stream. Five years ago, he created what he calls a “landing area” beside another pond just inside the home’s side gate. It’s a relaxing space filled with outdoor easy chairs and couches and a fire pit created from a huge Polynesian, wok-style caldron originally used for stir-frying large amounts of food. With an old, exotic packing crate used as an end table, the seating area reflects Rand's love of vintage furniture and accessories and his talent for repurposing antique items in unusual ways. 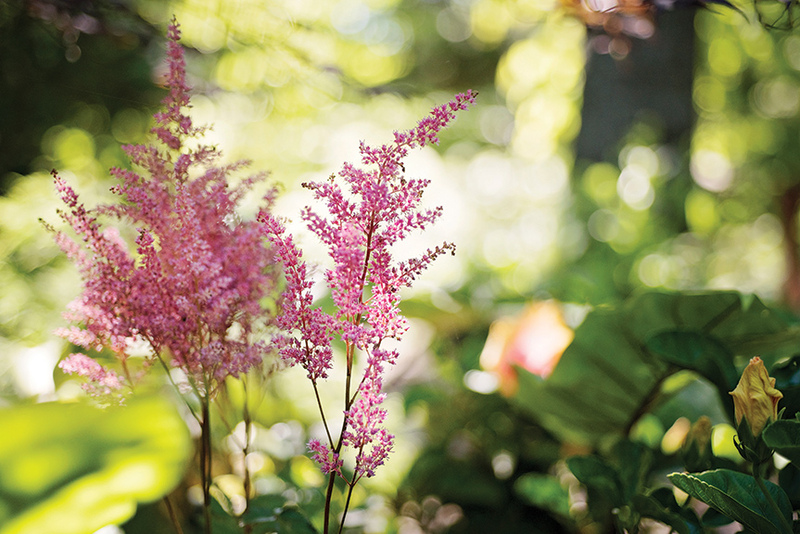 Garden basics include reliables such as oak leaf hydrangeas, which he loves for the scent as well as the flowers and fall color; native "Annabelle" hydrangeas; late-flowering "Tardiva" hydrangeas, and winterberry for its bright fruit, which adds winter color. 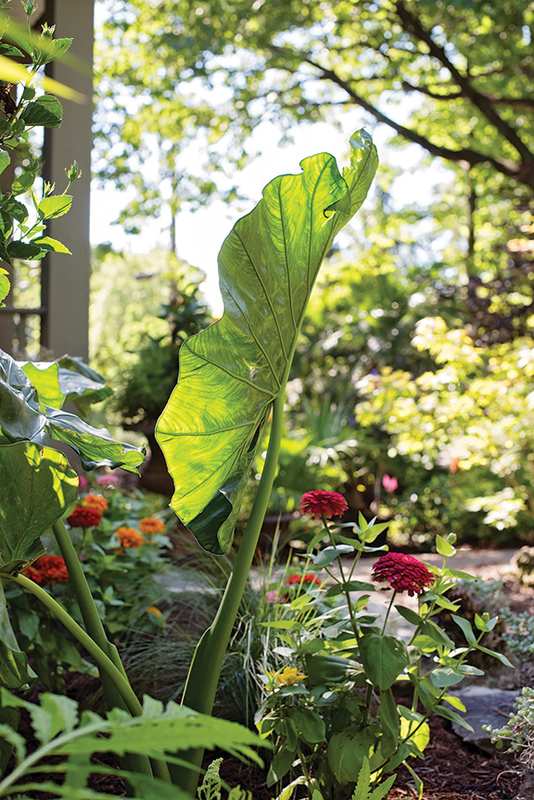 He’s also partial to big-leaved hostas, such as florescent green "Guacamole" and the monstrously large, moss-green, circular leaves of the gunnera that was on the property when he arrived. But nothing is static. “I change the garden every year,” he notes. 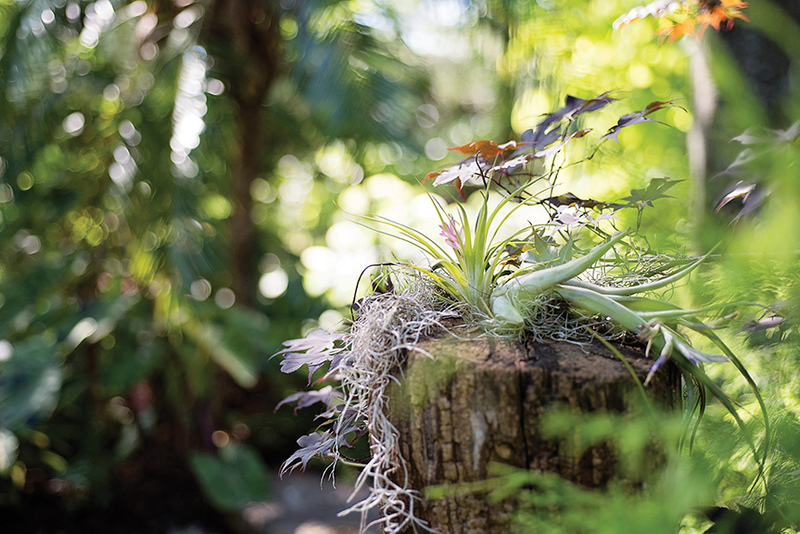 “Things are moved around and re-arranged.” In addition, a healthy dose of tropical plants keeps everything looking fresh and can bring a new look to the garden from year to year. 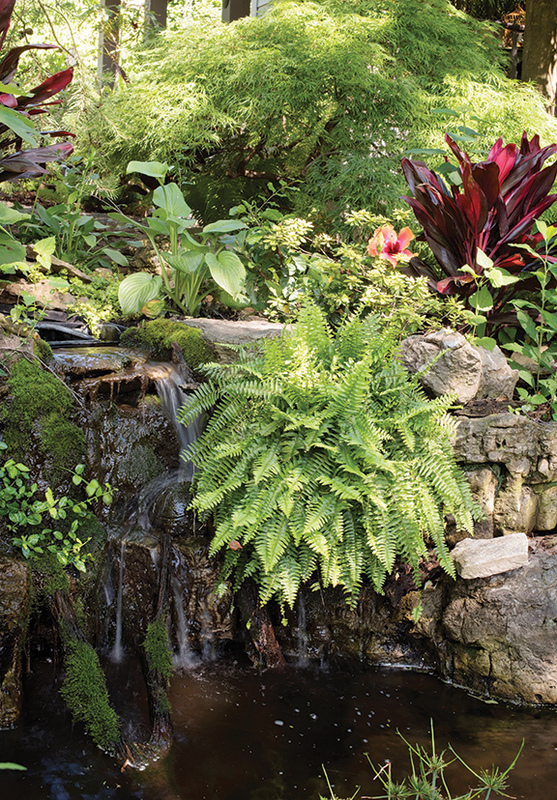 This year’s favorite tropicals include an upright, narrow-leaved croton with strong fuchsia tones, called "Mammy;" hot pink cordyline or Hawaiian ti plant; a multicolored hibiscus (featured at Straub’s stores); a green-and-purple-speckled elephant ear, and a bold Chinese fan palm. He considers them landscape “thrillers” because of their bold colors and architectural shapes. 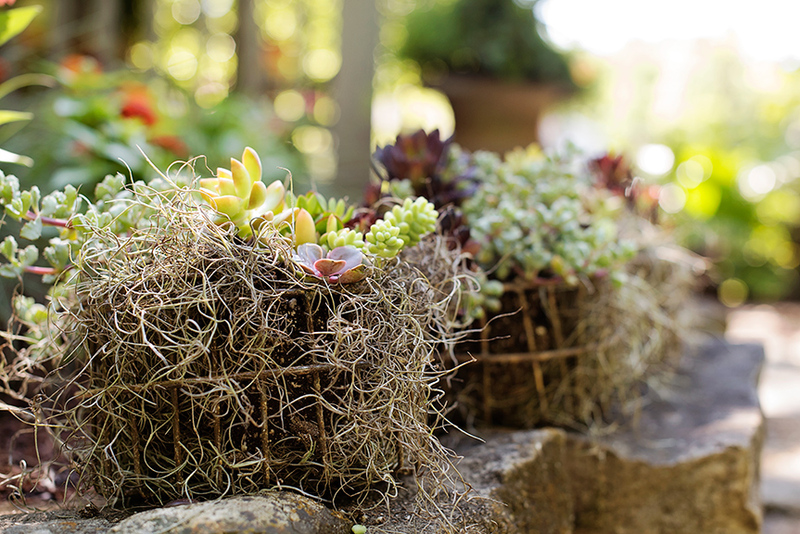 He also loves succulents for their durability, easy care and the additional dimensions of unusual shapes and interesting textures they bring to the garden. He tucks them into a variety of unexpected places from the ends of dead logs to rusty lanterns. When his daughter Lindsay, who is being married in August, asked to use the garden as the venue for a bridal shower, Rand created table centerpieces filled with a variety of succulents. “We pulled out all the stops,” he says, beaming like a proud dad. 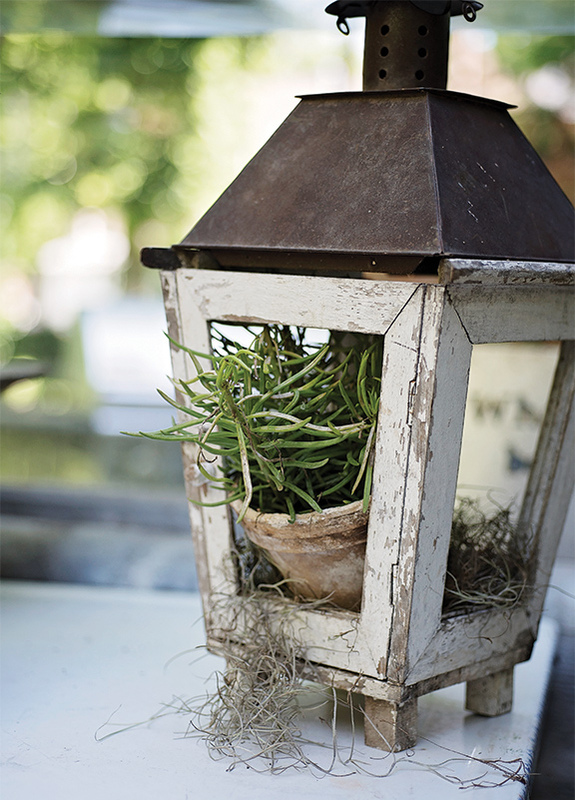 When it comes to decorating his garden with things other than plant material, Rand also likes to think outside the box. “I like objects worn with time,” he says. That’s why there is a small windmill rising from a garden border. “I love the movement when there is a breeze,” he explains. He also has incorporated a well-worn oxen yoke, an old soil tiller and stone boudoir-style chairs from a St. Louis estate into the landscape and created a garden shed from old barn wood. He has been known to design plantings around an old bicycle and to “upholster” a dilapidated couch with succulents and pumpkins. Weathered wood in the form of old tree trumps and fallen logs become planters and architectural objects. 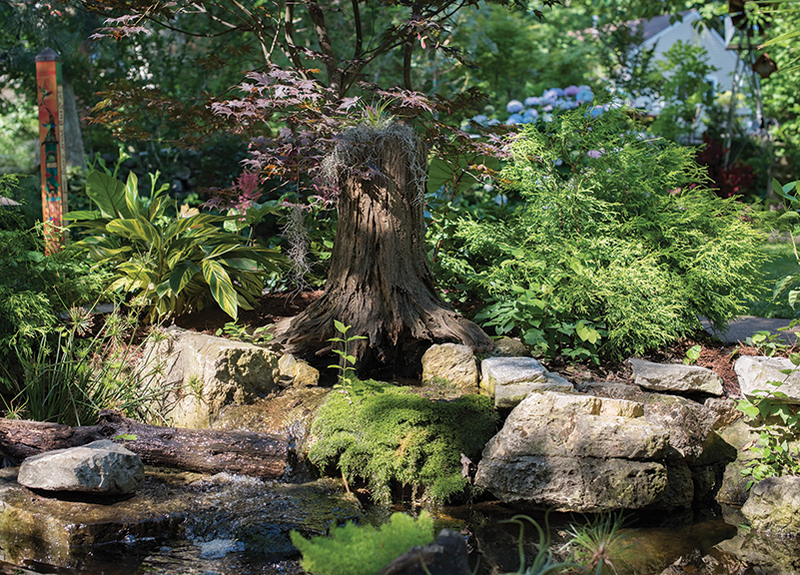 “I love to add pieces of wood to the garden because I want everything to look as natural as possible,” he explains. He also urges homeowners to “read up” on what they are planting and pay attention to sun, shade and moisture requirements. For additional inspiration, he suggests simply strolling through the Missouri Botanical Garden. “It’s a great outlet for learning,” he says.